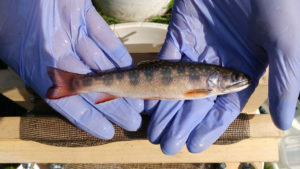 Sustained by groundwater, cold and fasting flowing, Harper Creek in the south west end of Peterborough is home to one of the few remaining wild brook trout populations in Southern Ontario. And so little is known about them. 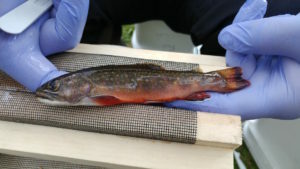 In the fall of 2016, a citizen science effort led to the identification of preferred spawning habitat within the creek, and a first good look at this cryptic species; an initial attempt to gauge trout numbers, their presence and use of habitat in the main branch and tributaries of Harper Creek. 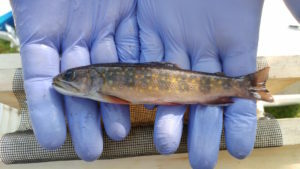 But where do the trout go after spawning; in wintertime, or at night? 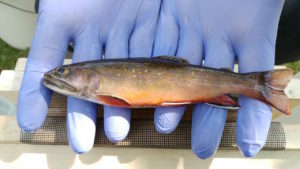 What are the factors that influence trout movement within the creek and it’s tributaries? 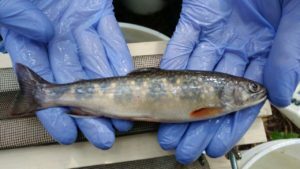 What impact does human development have on the behaviour of these fish, and why? 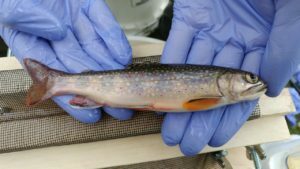 By tagging 20 brook trout, Scott Blair and his research team will be able to follow their daily and seasonal movement, providing a window into the life history of wild brook trout in an urbanized watershed. Critical to the research effort are the radio tags that will allow the team to track trout movement. The tags are quite expensive, so we looked to our community of friends and supporters to help fund this scientific effort; without their incredible response, this project would not be possible. 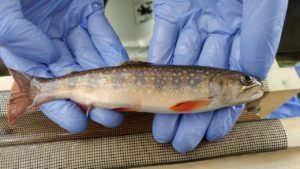 This page is dedicated to the heroes of this story – the iconic brook trout of Harper Creek and those who sponsored them.